Still a hero? 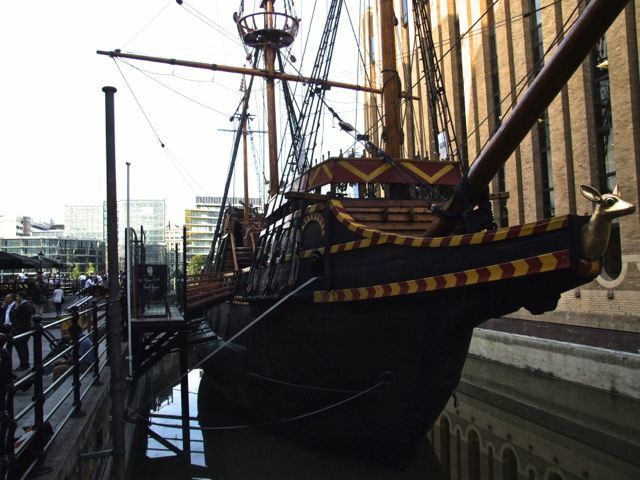 A reconstruction of Drake’s Golden Hind, London 2013. People have all sorts of heroes and heroines – actors, musicians, sports stars, even politicians. The late Tony Benn, who sadly died a couple of days ago, was a hero to many people, because of his dedication to his beliefs. And an anti-hero to others, for the same reason (1). The word ‘hero’ used to be mainly associated with people engaged in war or politics, but the definition of heroism has changed a lot over time. The association with conflict is still there, but the notion of ‘who can be considered heroic’ has widened. It now includes people who fight indomitably against ill-health or adverse social conditions, or achieve something else of importance against great odds. However, the more you know about heroes in history, the more problematic they can become. For example, the Victorian historian J A Froude acknowledged that there was something of the pirate about Francis Drake and John Hawkins, the great 16th-century English seafarers, but also wrote that ‘the instinct of their countrymen gave them a place among the fighting heroes of England, from which I do not think they will be deposed by the eventual verdict of history’ (2). Froude saw liberty and Protestantism as interlinked, and in his opinion Drake and his colleagues saved England from the tyranny of 16th-century Catholic Spain. Nowadays, though, we tend to take a much more relativistic view of the past than did Froude. We have far less faith in ‘the eventual verdict of history’ and recognise that historical ideas tend to change as society itself changes. Does this make people like Drake any less heroic? Undeniably, he led the second-ever circumnavigation of the globe, fought the Spanish Empire and played a big part in the defeat of the Spanish Armada. Equally undeniably, Drake also operated as a pirate, took part in the transatlantic slave trade with Hawkins, helped to ramp-up the tension between England and Spain, and deserted his post at a critical point in the Armada campaign to go after a prize ship. Where’s the hero now? The answer is that Drake was all of these things – one of the first English national heroes to come from humble origins and a defender of his country, but also a pirate and sometime slave-trader. The great heroes of history were probably all flawed, in one way or another, because they were human beings. This doesn’t mean that you cannot admire the good and brave things they did, just that uncritical hero-worship needs to be avoided (3). In the wrong hands, the legend of a national hero from the past can end up being used to justify bludgeoning people in the present. Do I have a hero from history? Sort of. It’s unlikely that you will have heard of him. He was an English master shipwright named Henry Hellewarde, who lived in the late 13th and early 14th centuries. His only known major achievement was the successful construction of a large war galley for King Edward I, one of a number of such vessels built between 1294 and 1296 (4). Short of building a castle or a cathedral, constructing a big galley was one of the most daunting engineering projects of the time. The galley had about 80 oars and was built at York, a big city, but a long way from the sea and not a good place to build a large warship, even then. The building account for the galley allows us to work out a few things about Hellewarde: as a master shipwright, he knew how to design and make a complex oared fighting ship; he was an able man, managing a large team and overseeing a major project that consumed a great deal of valuable raw materials; he was a canny operator, emerging from the project as one its highest earners (the other high earners were all officials or merchants); he was a successful craftsman, able to complete the galley and get it into service at sea. Little else is known about Hellewarde. On another occasion he was accused of taking part in theft of goods from a ship, but there is no way of knowing if the accusation was true. What is true is that he was able to create one of the most challenging vessels of his day and make it work. For those things, I admire him. I don’t know what he thought about the poor or the position of women, what he was like to his kids (though three of them seem to have worked for him), or much else that belongs to conventional biography. Perhaps that’s just as well. (1) I know that using the word ‘heroine’ (the person) is becoming less and less common, partly because it sounds like ‘heroin’ (the drug), but also for reasons of feminism, though compromising on the male form of a name as the current usage does not strike me as a particularly feminist thing to do. (2) J A Froude, English Seamen in the Sixteenth Century, London 1909, p 140. (3) John Cummins’ biography, Francis Drake. The Lives of a Hero (London 1995), is particularly good on the question of the reality of Drake’s life and the subsequent myth-making. (4) The original document is in The National Archives (TNA), E101/5/8. You can find out more about Hellewarde, the York vessel and the other 1295 vessels in my 2013 Gresham College Lecture, ‘1295: the Year of the Galleys’: the transcript and a video are available at http://www.gresham.ac.uk/lectures-and-events/1295-the-year-of-the-galleys; the video can also be seen at http://www.youtube.com/watch?v=rp3R46dAmj0.